Browse any of the 54 specialty merchants or peruse the menus of 17 restaurants.You’ll sense a difference at Seaport Village. It’s shopping that doesn’t quite feel like it. Four miles of tree-lined paths. Quaint maritime buildings. Fourteen acres of coastal paradise. Sweeping panoramas of San Diego’s Big Bay. Weekly music and entertainment. All of it made even better by that everyday San Diego sun. 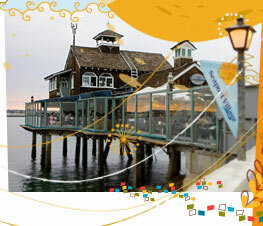 Whether shopping, dining or just strolling, Seaport Village provides it all. Everything. Under the sun. Four miles of meandering cobblestone pathways bordered by ponds, lakes, fountains and colorful, lush landscaping. Quarter mile boardwalk along the San Diego Bay. Four bay-view dining restaurants. Thirteen international eateries. Unique clothing, gifts, hats, mugs, kites, wind chimes, music boxes, jewelry, hot sauces, art galleries, bookstore/coffeehouse and more!